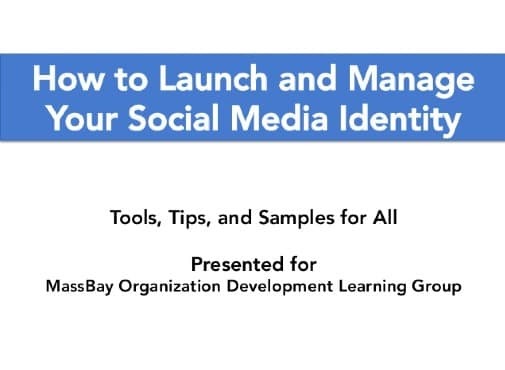 Last Thursday night I gave a presentation to the Massachusetts Bay Organization Development Learning Group [update 2015: now Boston Facilitators Roundtable] on how to grab hold of the marketing world that’s spinning around us and get a tangible handle on how to launch and manage a social media identity. Both the deck presentation and some recommended resources are available above and below. I wanted to give a bit of deeper context – short of having to rewrite the entire deck to fill in for my missing voice track. I came into social media in the past 2 years and can never claim to be an expert. I am still a student as I discovered the 2008 marketing world is a whole new game than the 2002 marketing world I learned was just completing as part of my dual marketing/finance major from my MBA School. I discovered what I had learned in 2002 was not only out-dated, but out of touch. I earnestly feel up to 80% of the marketing world, or marketing 1.0, is irrelevant in marketing 2.0, 3.0, or social media world (aka today’s marketing reality); the speed of change happening in marketing was no fault of the university. Spending most of this decade in strategy consulting I looked forward to return to marketing. I love marketing. To me, marketing is about motivation, and strategy and organization development relies heavily on motivation and communication – made me believe the return to marketing a smooth transition. My marketing experience was not chump change, I worked in marketing at Fortune 500 companies, a record company, and a host of highly visible and diverse marketing roles. Yes, well, the reality: I was not prepared. Moving to Boston was part of the change to facilitate a return to marketing. My first goal was to look at some current writing on marketing, I discovered, The New Rules of Marketing and PR by David Meerman Scott – recommended with other books, below – great title for someone like me interested in a challenge to the norm. The New Rules of Marketing and PR overwhelmed with how much changed. I restarted the book with a pad of paper to take notes. From the book I began to peel back the layers of the onion that social media brought to marketing. So, the presentation within this blog is for people who may feel a bit overwhelmed or unsure if it is even worth it. My advice: it is, very much worth it. What’s great! This new marketing world is so collaborative, it’s easy to see the change relies on involvement. Let’s not pretend companies out there don’t try to co-opt social media or viral marketing to the marketing world they knew, but the transparency is obvious and so many companies know how to do it right. A great reference for your online effort is this List of Best and Worst Practices for Designing a High Traffic Website as a helpful as a quality check for getting found when writing your blog or website. Please share the deck, the blog, or any of the recommendations with anyone you think would find value from them; that’s how I learned. I welcome your thoughts and comments, oh, and here’s my a link to my Twitter account @TobyElwin. 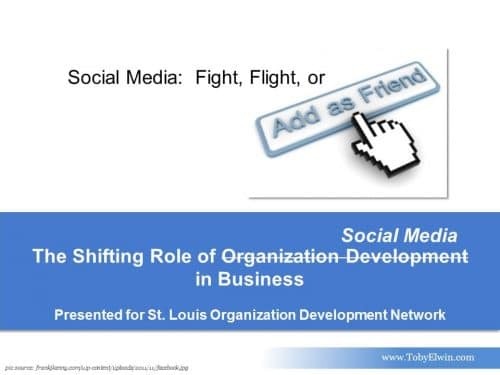 A good compliment to this presentation may be a presentation delivered in 2012 on social media and organization development. Very thorough list. I see you reference Hubspot’s website (and Dharmesh’s excellent blog). I thought it might be helpful to point folks to this sub domain on Hubspot directly http://learning.hubspot.com/ which is an unbelievable resource for Inbound Marketing. Great stuff there. Thank you for the comment. HubSpot is a great resource. Top of mind when I talk to anyone interested in moving from the “what” to the “why” and further to the practical “how”. I recommend them at every turn and every presentation. As well as your recommended link above, HubSpot’s Inbound Marketing University offers free training and certification through modules and videos is fantastic. 2007 to 2011 I lived in Cambridge, MA. As social media dawned on me it was a stroke of luck HubSpot was two streets over. There is genuine excellence and commitment to cultivate and build confidence through transparency. Getting to know some of the folks at HubSpot makes dealing with many other social-media-types feel like dealing with snake oil salesmen and hucksters. When I work with companies, small businesses, and individuals and try to untangle the mess of bad advice or misconception, the first place I recommend for recovery is HubSpot. Thank you, again, for the comments. I have a recent presentation called Social Media: Fight, Flight, or Friend that has other recommendations and thoughts what works and why. Looks like what you are doing with inbound marketing at Optimize3.0 is clearly in line. Some good advice on social media in your post. It is really important to utilize the tools that we have at our disposal, and I like Hubspot for its tutorials as well. Thanks for all of the information you have packed into this one blog post. I appreciate you found time to comment on what you found of help. The tools really offer a great way to engage, but the principles of why to engage seem under served in many dialogues I have on business or individual social media strategies. So the presentation offers as much insight into the frame of mind over just the tools. Principles, Patterns, and Process for design, in a post called 4 design tools to meet persona context I add a 4th – Promise. With your social media principles, patterns, process, and promise in mind, the tools become your lever to engage and less of a challenge to wrest control of. Social Media identity is significant for business because if you want people on your website then you should focus on brand awareness and visibility. If you are not on social media website then PPL think you are not up to the mark so, make your site users friendly through social media sites like Facebook, Twitter and Pinterest. You provided various tools which we use for social media platform, some of them are very engaging for users. From today, I am going to implement all these tools which you discussed here. Engagement is a two-way street: I want to engage and you want to engage. Of course the element that rubs each side is WIIFM? (What’s in it For Me?). The best in social media genuinely know the answer. The majority, still see it as a sales channel. In your social games, what percentage of your time is building sponsor awareness of this subtle, but real difference? I value your insight. There are so many tool which we use for social media exposure but i think we don’t know which tool is effective and in what areas. Indeed, hubspot.com learning is good for those who doesn’t know about these incredible tools. And ultimately, if you have nothing of value to contribute, the tool is irrelevent. In my seminars I always start with listening, engaging, and writing for Twitter. If you can not be compelling in 140 characters, you certainly are not going to be too compelling in any other medium. I find HubSpot and particularly HubSpot’s Inbound Marketing University is about why and how, less about where or what. Where is your community of interest most engaging? yes i agree with you Susan Gray greats social media tips shared. Thank you for the comment. What has been your most successful social media community and how do you engage in the community: read, write, contribute, comment? “Web Consulting” is not an option it is essential for every online business. Internet is a fierce battleground and very few attain victory by luck. True, luck is not much of a scaleable strategy. However, social media offers those genuine in their communities of passion little they need to learn or believe they have to do other than to be themselves. Once you find a community you resonate with you do not have to try, you just be yourself. Now, if you are are trying to manipulate for gain, that is when the Internet becomes fierce, but like any arena, you learn or your whither. What is the hardest hurdle you’ve faced pitching to your client the concept of an effort to identify a community persona before diving in? Though and carefully researched how to maintain great social media presence Toby! It is true, like any conversation, you need to start by listening. Too many still look to social media to announce their presence, not engage in conversation. Where have you found the best social media channels for conversations, but a focus on the exchange of goods and services? Thanks for posting them Toby. Do you think it’s worth it for companies to use different profiles which match different target customer groups? My industry has two distinct groups so I was thinking of creating fake profiles which would appeal to them. I am not sure fake anything helps credibility. You should engage with genuine transparency. Identify the market numbers and back it up by creating content that answers that market’s needs. I am really unsure if you are serious in suggesting creating fake profiles, unless I you are talking about persona profiles to help identify and plan content creation. I am not sure what you mean by fake profiles. The persona is an archetype of people you want to connect with to make sure you content is valued from their perspective and to keep you on target to meet their needs first. Only successfully meeting their needs, do you have hope to become a source for their solution. How do you find Effective Marketing connects with their community? What was the strategy? Nice post and list of resources. I’d add one to the book list — The Now Revolution…. Jay Baer and Amber Naslund wrote it…. think you’ll find it very insightful and helpful. Thanks for the recommendation for The Now Revolution. I am enjoying Trust Agents by Chris Brogan and Julien Smith and getting some good baseline logic and defense of the act of trust. Have your read it? Yes I did read it. Outstanding book by two smart guys that I’ve had to good fortune of getting to know over the years. I’m looking forward to grabbing their new book when it comes out too. Here’s a timeline of books I’ve been most influenced by. Select picture to open. This was put together for a presentation with hyperlinks to all the sources. I have been trying to get my head around social media. I have been so busy with my time in other areas that this side of my hopefully online business has been neglected. Still not totally clear how to go about it but some great resources here. Better get started before I become extinct as the dodo. Books on social media fly off the presses, but sometimes I prefer bloggers thoughts as books become dated before the print is dry and blogs are fluid. 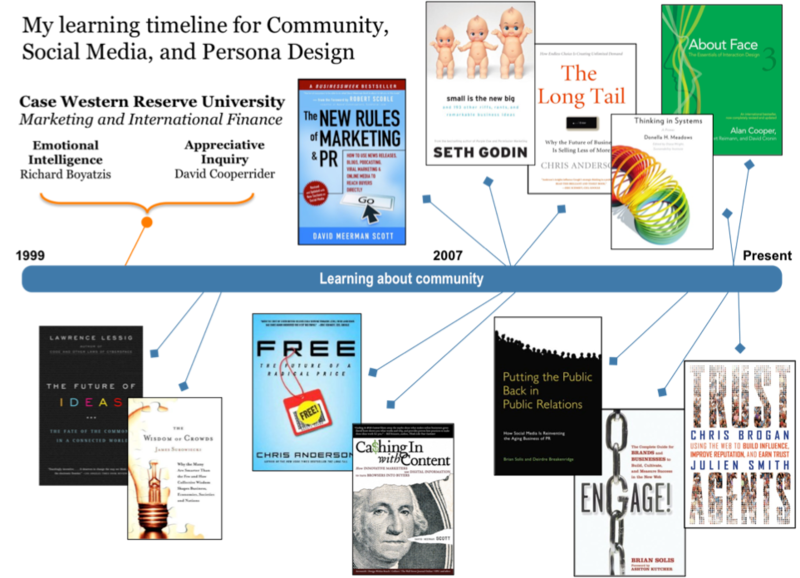 When I wrote this post, originally in 2010, I reviewed some of the above recommendations and find the principles remain: Godin, Brogan, HubSpot, Volpe, Meerman Scott, SEOmoz, Blossom. It is a testament to their dedication and their influence. Not sure who else to short-list recommend to anyone over the majority of influencers then with influential staying power. I’ve discovered others since and that sums up social media: constant discovery. Who has influenced your social media discovery? Appreciated work is hard to do, thank you for the comment. I have a lot of images on my site so have just set up a Pinterest account only beenonthere a couple of times. I will be honest seems it is all just copied material which got me to thinking is there a copy write issue here. Pinterest is getting loads of attention from google as it obviously ranks it very well which I also can’t understand. What I was really after though do you get back links for all each image that someone takes off your site and pins on pinterest????? And is there a basic principal to use to help optimise your site yourself on Pinterest????. Sources are intended to give credit and in a transparent way. Each post from Pinterest is linked to the source article, I see that as positive: pin something you like, the source is linked, someone likes what you pinned, they click on the link, and a new person has discovered new content courtesy of your pin. Optimize your site for Pinterest? I am not sure I have the skill to answer that question. If you use pictures in your posts than and provide Pinterest button for people to easily “Pin It”. Pinterest is not part of my online identity, I do not have a Pinterest page, because I could not properly dedicate time enough for a proper page. I have not seen it as a copyright offense. If you are getting a lot of pins seems you have content to pin and are doing well already. Do you link to other’s content, do you find linking to other’s content important to your writing? Really great resources Toby. Thanks for your efforts. Hi Toby, a great overview for social media, thanks so much for collating all this and putting it all in one place. I’m always learning and enjoying all the information. Links to people who are doing it right is most valuable to me. demonstration and actions are sometimes clearer than someone telling you what to do. When really its sometimes easier to SEE what they are doing. People doing social media right is how we all learn social media. I appreciate stopping by and your link for others to see on getting started on Twitter. Twitter is one of my preferred connections, but not for everyone or everything – as is true for communication channels throughout time: morse code, smoke signals, papyrus, telegram, telephone, and on. Thank you, Gareth, for stopping by. Who was your bigger social media influences? Very true. I think its important to have a profile for your intended audience and use the best communications for them. If they use twitter, use twitter. Of course if you’re target audience do not use your favorite tool its not constructive.